All across Germany the Schwartz, Rot, and Gold waves proudly. Apartment balconies are dripping with flags. Cars are gift wrapped in mini-flags, magnets, and mirror socks. And at Ikea this week, I even saw a woman with black hair who had bleached in the colors of the flag on the backside of her head. Now that is commitment! The country is head over heals for Die Mannschaft. Germans (as well as expats) are buying up all the Schwartz, Rot, and Gold in sight before the World Cup final on Sunday. For an American, this seems normal. This is what one does when your local team is about to play for the World Championship. We wear our jerseys, we hang flags of the team from our car, we paint our faces, and we invite everyone we know over for a giant barbecue to watch the big game. But how often in America does an International sporting event push its citizens to buy up American flags and wear our Red, White, and Blue? When has the nation ever shown such love for one’s country and for a National sports team all at the same time? The bout between Joe Lewis and Max Schmeling in 1936? The Men’s Olympic Hockey final in 1980? The Women’s World Cup Final in 1991? I dare say, the US has never gotten behind one team as a nation, any time, for any sport. That is not to say that Americans are not patriotic. Americans love their Red, White, and Blue. We let our flag fly all the time. We have a special code when it comes to our flag. We say a pledge of allegiance everyday at school. We sing the National Anthem before every sporting event. We celebrate our National Pride at least 3 times a year on Veterans Day, Memorial Day, and Independence Day. Americans love to celebrate the greatness of their country. ‘murica! For Germans though, Patriotism is…well…complicated. For years after World War II, the German flag was something only flown over government buildings. And no one would ever wear national colors. If you flew a flag or painted your face, you were being too nationalistic. The showing of national pride was just too reminiscent of an age from which Germany was seeking atonement. 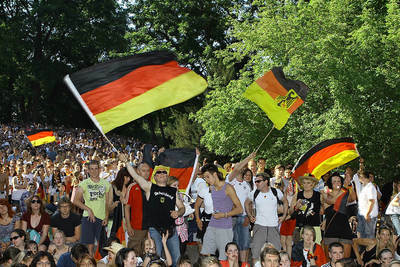 War guilt did not allow Germans to wear their colors and fly their flag until 2006 when everything changed. And what caused this awakening? Ask any German and they will tell you that hosting the World Cup in 2006 pushed the country down the road to a patriotic catharsis. Germans have a lot to be proud of. They have a winning economy, an excellent health care system, and a safe and free democracy. They make the best beer, the best cars, and the best football teams. And hopefully, after Sunday, they will have the coveted 4th star on their jerseys. Yet even to this day, Germans will not boast openly about the greatness of their country. There are no days devoted to National pride. There are no days to celebrate the heroes of the past. There are just the stark reminders of where that kind of national pride can lead. Only with football do Germans feel free to speak in superior tones. Only with football do they let themselves indulge in a little flag waving. What flag will you be waving on Sunday? Germany, naturally, but I am awfully nervous…I would feel so bad for Klose and Co if they are denied the title yet again. 2006 they were the winners of our heart, now it is time to become the winners for real. I’ll be wearing my Trikot under my shirt and tie! Along with the German nationalism idea, don’t forget that Germans no longer sing the first verse of the Deutschlandlied. “Germany, Germany, above all else” seems a bit too much nowadays. German’s typically don’t sing the anthem in celebration either. At the Fan Mile in Berlin, I saw lots of footage of there spontaneous singing, but not of the National Anthem. They sang Auf Gehts Deutschland, Ole, or other pop tunes. Thanks Jordan. Germany is a beautiful place filled with beautiful people. Can’t wait to watch the game. Hoping for victory and a little more flag waving. We’ll be all decked out in Schwarz Rot Gold here tonight! That’s an interesting observation about Americans. I always thought we waved our flags a lot more than we do, but you’re right that it’s not generally for a national sporting event. I think there was a bit more this year for the Olympics. And certainly more than in the past with the World Cup this year. I think that American’s also get behind a team/sport event after the fact. The US Hockey team of 1980 were stars AFTER the Olympics. The US Women’s Soccer team were on every commercial AFTER their win. I could not find one commercial sponsor that included the US Men’s Soccer team for the World Cup. Only ESPN featured them. It will be interesting to see how the US rally for their team in 4 years. For the last few weeks here in the US every store with a tv had the soccer matches on. But here there are so many nationalities living side by side, that you people aren’t all cheering for one team. I didn’t get caught up in the soccer fever here in the US until I watched the Brazil vs Germany match. Germany was awesome! Germany IS awesome …. I hadn’t actually considered the complications of German patriotism. Interesting. Very very interesting, and something I was speaking about just the other day to a German friend who said his dad had forbidden any celebration of his country because he felt guilty/ashamed of its relatively recent history. I’m pleased that this feeling isn’t prevalent any more because, for God’s sake, it’s a long time ago. What really, really hacks me off is that the British media will ALWAYS, without fail, bring up asinine references to the war after any sporting event involving England/Germany – ‘Don’t mention the score’ was a particularly famous one. However… that is shifting here too. I watched the final in a pub on Sunday, and there was an almost exact 50/50 mix of German and Argentina supporters – and that was mainly because there was a load of Argentineans staying upstairs! I got absolutely no hint of any war references / long-standing, stale prejudice, and the atmosphere was brilliant. People seemed genuinely pleased Germany won. And then the next day, apart from one or two snide comments from the more retarded newspapers, the stories focussed more on the sport and less on dredging up history. I would very much like to think that the world is moving on and finally getting over it! Me too. But I appreciate that Germans are wary of Nationalism. Sometimes I wish my homeland would turn it down a notch. I think this also comes in living in isolation as well. We border two countries, one of which speaks the same language. If we bordered 12, all speaking different languages, maybe we would be always screaming that we are the best. I wish my homeland would turn it down a notch also- overwhelming shows of patriotism make me genuinely uncomfortable. Groups of people chanting “u-s-a, u-s-a” makes me want to go somewhere else to be alone. For the record, I wore my German colors to the final, and I also wore them when they played the US- I have absolutely no emotional attachment to the American team, but I’ve formed a genuine affection for the German team over the last few years that I’ve lived in Germany. It’s probably the only time in my life that I’ve been able to name that many players on any single sports team, because I don’t usually watch sports all that much. I’m happy they won.